Just as US index ETFs have moved higher, global stock markets have moved higher recently as well. 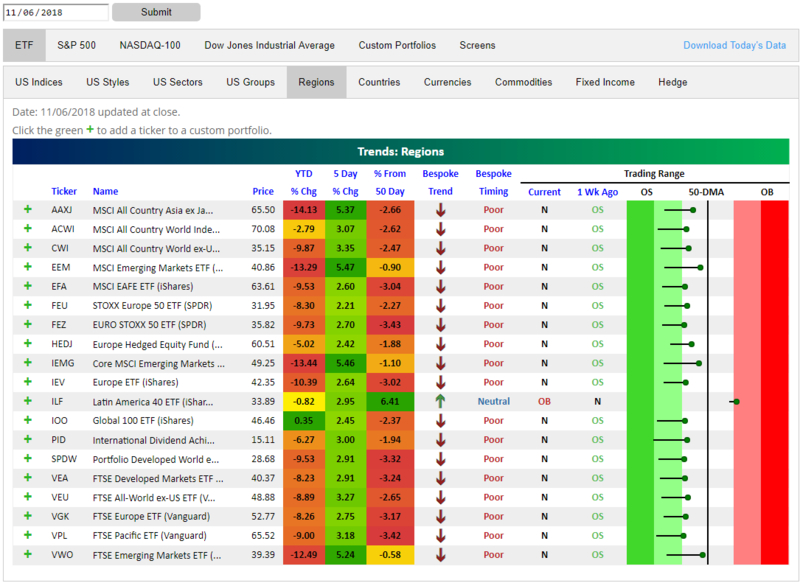 Below is a snapshot of regional stock market ETFs from our popular Trend Analyzer tool. As you can see, while YTD changes are still deep in the red and ETFs are still well below their 50-day moving averages, the 5-day percentage change is extremely strong. The move higher over the last week has pushed every ETF in the group out of oversold territory and into neutral territory. One ETF (Latin America) has actually moved to overbought levels. While all of these ETFs have moved higher recently, note that because of the severe weakness experienced for global stocks over the last few months, they’re nearly all in long-term downtrends. It’s going to take more than just a week of gains for new uptrends to emerge. There’s still a lot of work for the bulls to do!